When you need a jump start so that you can get to the store to buy a new battery, follow the safety precautions below. And remember, jumper cables normally have a set of clamps marked red for positive and one marked black for negative. And battery terminals are usually marked with a + for the positive terminal, and a - for negative. You might need to wipe off some grime to see them if your battery is dirty. Park the car you’ll use for jump-starting next to the one with the dead battery, positioned close enough so that the cables will reach. The vehicles should not touch one another. Turn off the ignition on both cars. First, clamp one end of the positive cable to the dead battery’s positive clamp. Now have a helper connect the other end of that cable to the other battery’s positive clamp. Next, connect the negative cable to the negative terminal on the good battery. 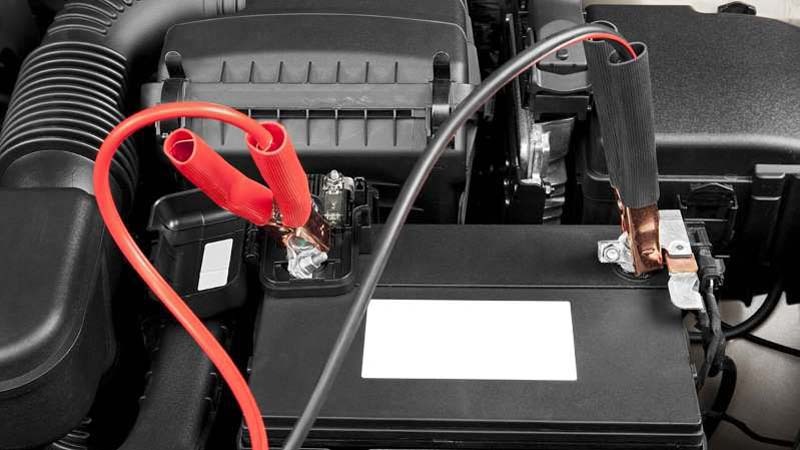 Finally, connect the other end of the negative cable to a ground on the vehicle with the dead battery. This can be the engine block or another metal surface away from the battery. Be careful not to touch the two ends of the cable together while doing this. Start the rescue car that is providing the electricity. Start the car with the weak battery. If it doesn’t start, check your connections and tighten or clean as needed. If it does start, let the problem car run for at least 20 minutes to allow the battery to recharge before shutting it off. If it still doesn’t start, there is another problem to be addressed. Call a local service station for help. Disconnect the cables in the reverse order.